Disclaimer: I don't claim to be an expert in Data Protection Manager 2007! However after recent experiences, I believe that the following items should be considered when evaluating DPM 2007 SP1 for protecting your Sharepoint/MOSS 2007 farm. 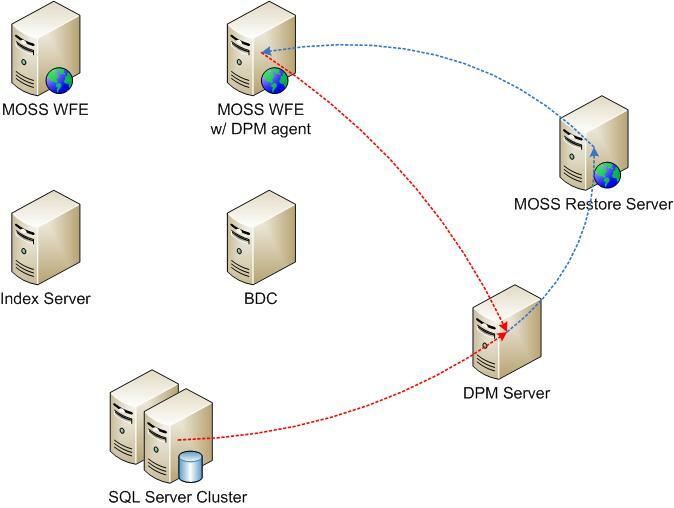 Note: DPM 2007 SP1 is required to protect backend SQL Server clusters. Don't even consider DPM 2007 without SP1. To restore anything less granular than a single content database, DPM will copy the entire relevant content database to the restoration MOSS server. This can involve significant amounts of time (e.g. you have a 100GB content DB, and you wish to restore a single document, DPM will still copy the entire 100GB content DB). This content DB is then mounted on the temporary server (ensure you have enough disk space on this server to cater for your largest content DB) and the relevant item(s) extracted. Maintaining this restoration SharePoint server consumes additional hardware, Windows OS license and SharePoint licence. If DPM is performing a backup, you can’t do a restore without cancelling the in progress backup. However in my experience the actual backup can take a long time (in the order of many hours) if the WFE that you have your DPM agent on is busy (e.g. participating in crawling content). DPM backups will also fail if the SQL Server is heavily loaded (e.g. backups of SQL Server or other maintenance operations are in progress). This can restrict what SLAs you are able to offer to your end users. Installing DPM relies on a bunch of hotfixes and other stuff to be installed to get it working properly. There’s even a DPM hotfix you need to install if you install MOSS Feb 2009 CU, because somehow that MOSS CU stops DPM discovering your MOSS installation as a protectable item. VSS is another thing that seems to require continual patching. Overall, in a smaller environment, DPM 2007 would be simple and easy to use. The console is quite intuitive (even if the setup requirements are a bit obtuse). In a larger enterprise enviroment, I would hesitate to recommend DPM 2007. There are simply too many limitations in the backup and restore process, that end up hobbling the product.